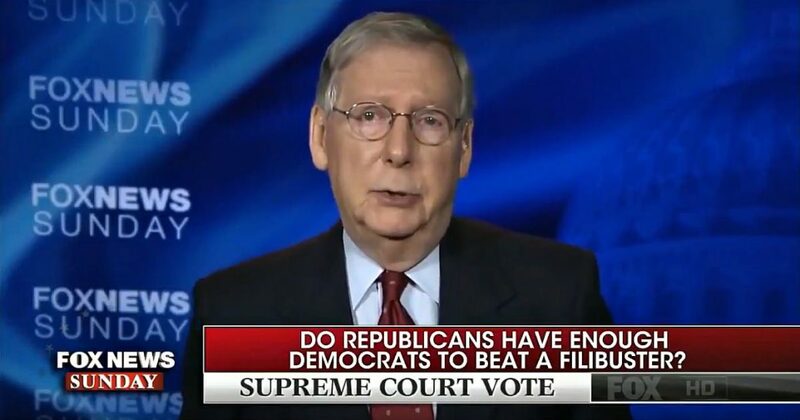 Senate majority leader Mitch McConnell (R-KY) appeared on Fox News SUNDAY with Chris Wallace Sunday morning where he promised the American people that the Senate would confirm Judge Neil Gorsuch to the Supreme Court by Friday! Chris Wallace: You have promised that the Senate will confirm Judge Neil Gorsuch to the U.S. Supreme Court by Friday. Two questions. One, do you stand by that schedule, a Friday vote? And two, do you have the eight votes of Democrats so that you can beat a filibuster? Mitch McConnell: Well, look, Judge Gorsuch deserves to be confirmed. You know, unanimously well qualified by the American Bar Association. My counterpart, Senator Schumer, once called that the gold standard. In the majority, 99 percent of the time. Ninety-seven percent of his rulings were unanimous. Only reversed one time in a case in which he participated by the Supreme Court. President Obama’s former acting solicitor general said there’s no principle reason to oppose him. That’s why he will ultimately be confirmed. Exactly how that happens, Chris, will be up to our Democratic colleagues. I think it is noteworthy that no Supreme Court justice has ever, in the history of our country, been stopped by a partisan filibuster, ever. And, in fact, the business of filibustering judges is a fairly recent invention, ironically, of the now minority in the Senate, the Democrats… And in particular, Senator Schumer, who convinced his colleagues, after Bush 43 got elected, to start routinely filibustering judges. Chris Wallace: Let me ask you, though, some specific questions. Will there be a confirmation vote by Friday? Mitch McConnell: Yes, we’re going to confirm Judge Gorsuch this week. Chris Wallace: Secondly, do you have the eight Democratic votes, as we sit here today, to avoid a filibuster? Mitch McConnell: Well, I don’t think we know.